Hey friends! It's another field trip post! This time all the way from New York City! 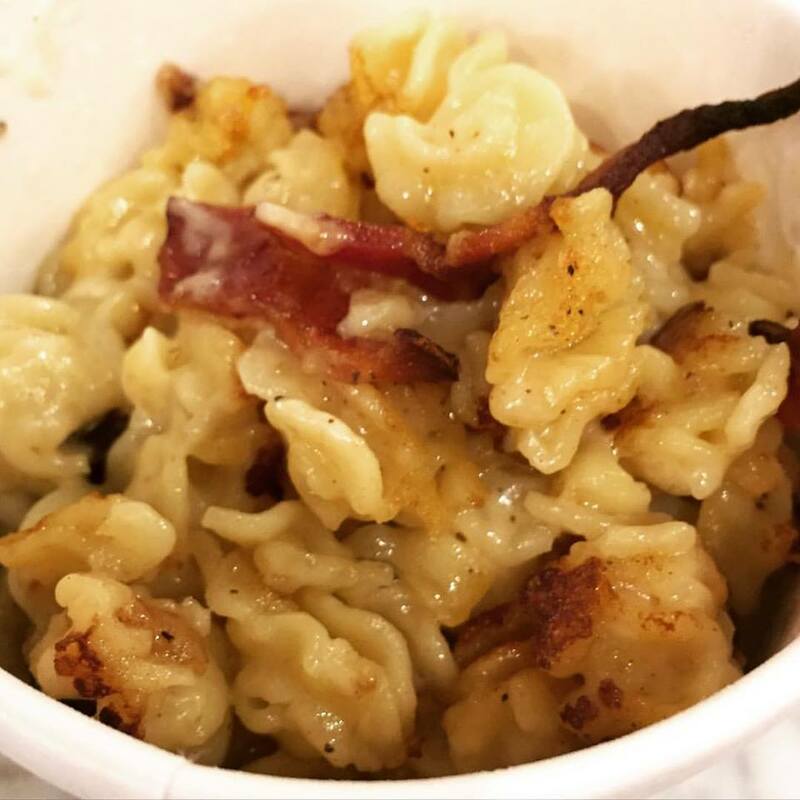 There were several restaurants to try while visiting the Big Apple, but I knew that I had to make some room for some local Mac and Cheese! I did some research and eventually found that Murray's Cheese Bar was a pretty popular choice. To be fair, somehow, we found ourselves at Murray's Cheese Shop (owned by the same folks) in Greenwich Village instead. I haven't been to the Bar location, but from what I've read, I would assume that the Bar is more like a restaurant, whereas the Shop is more like, well, a shop. Looking back, I'm actually kind of happy we found ourselves in the Shop location. it was cute and had a massive amount of unique and fine cheeses and meats and right in the middle of it was this awesome kiosk where you could order all sorts of goodies, including a build-your-own mac and cheese. I opted for just adding some bacon (I don't care what the World Health Organization says). The sauce was made up of their special blend of 3 cheeses and then you could choose between any number of toppings or additions. The sauce wasn't super creamy but it definitely wasn't dry. I would say this would be a great recommendation for anyone who doesn't like their sauce super heavy. The bacon flavor was a little overpowering of the cheese, so it was hard to judge alone, but overall, I really enjoyed it. And I enjoyed my trip into the shop. They had some great old jazz music on and loads of local foods and candy to purchase. It was pretty awesome. And lastly, I have to show off my new souvenir. We happened to be in town just before the New York Marathon, which was both really cool and kind of annoying. It was cool because you could see all the excitement during newscasts and lots of runners started coming in to the city and bringing along their pre-race energy. The best part was that the local sports stores (Nike, New Balance, Asics) all had some special marathon specific swag that you could purchase for that week only. Since I'm somewhat obsessed with Nike city specific swag, I figured I'd opt for this cool customized running shirt over the classic "I heart NY" tee. 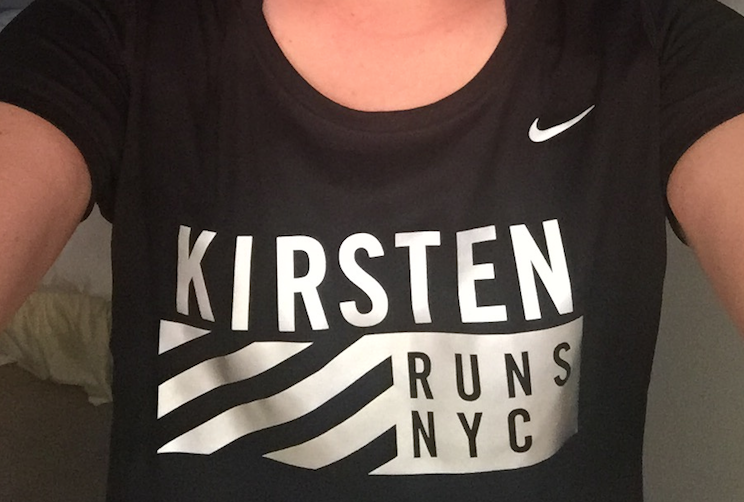 I even made sure to fit in a very quick jog through Central Park, just so I could wear it without feeling like a hypocrite. Haha! Anyway, cheers everyone and happy eating!